Ricky House is a newly renovated, stylish 2 bedrooms apartment located on the second and third floors of an old farmers’ building and reachable via twenty stairs. The apartment is located in the picturesque village of Nerano, an enchanting place immersed in the Mediterranean landscape between hills and sea. The apartment is only 10 minutes walking far from Marina del Cantone beach on the Gulf of Salerno. 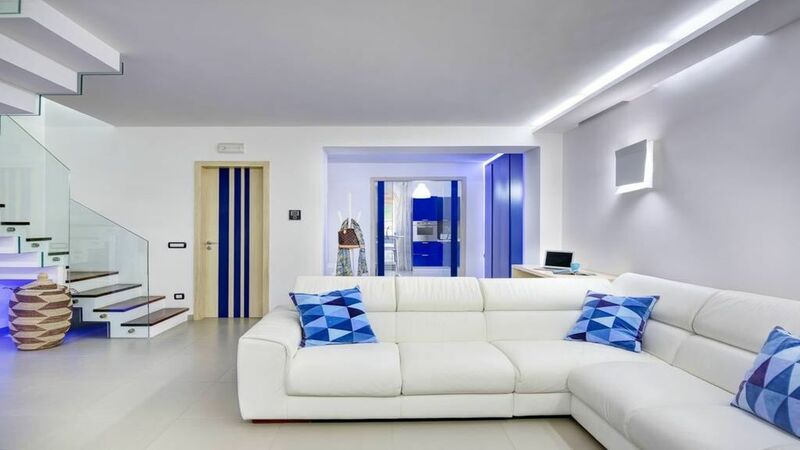 The apartment is filled with natural light; in line with the maritime tradition, the tones of blue and white, enhance the brightness, air feel and openness of the modern space furnished with elegance and taste. On the first floor, open plan, the entrance alcove separates the kitchen from the large lounge and living room featuring a L shaped white sofa, a 46”flat screen Satellite Tv and a four seats second dining area. From the window in front of the sofa, you will enjoy an amazing sea view. If you love cooking, you will be very happy with the dine-in kitchen with shining blue stainless steel appliances. It is equipped with all the essentials including four gas rings, oven, fridge freezer, dishwasher, kettle, toaster and mocha coffee maker. The small four seats table is perfect to have breakfast immersed in the natural light or for casual dining. A set of glass doors opens onto a small balcony overlooking the countryside; here you will find a washing machine and a separated dryer. Also located on the ground floor is a blue and white bathroom with spacious shower recess and modern design bathroom fixtures. A wide stairway with glass balustrades leads to the sleeping quarters at the second floor featuring high, slightly sloping ceilings with exposed wooden beams. The double bedroom is neatly furnished and enjoys access to a small balcony overlooking the sea, while across the hall is the single bedroom with its quaint maritime décor. The single bedroom also features direct access to an oversized sun-drenched terrace (approx. 15sqm) with view on the countryside furnished with outdoor lounge chairs. Both bedrooms are fitting with flat screen Satellite TV. The second bathroom, located on the upper level, is also tastefully decorated with maritime colours and features modern design bathroom fixtures, hairdryer, a wide mosaic shower enclosure and a Jacuzzi bath. The apartment has a centralized air-conditioning and heating system. It also enjoys high-speed WiFi access. Note that from 1 April to 31 October the Municipal Council of Massa Lubrense has instituted a mandatory tourist tax on all temporary residents. A tourist tax of € 2,00 per person per night (for guests 18 till 75 years old) for a maximum stay of 7 nights must be added to the total amount of the stay and must be paid in cash on arrival. We are Beniamino (call me Pippo) and Rosa, a young married couple who has been working for years in the tourism industry. Rosa and her family own one of the most famous sea food restaurants in the area, the one where Nerano’s typical dish – spaghetti with zucchini – was invented more than 1 hundred years ago. Pippo is the president of a boat charter company operating in the area. We live in Nerano and have an extensive knowledge of the area and of the tourism industry, which will make us able to assist you in the best way possible during your stay. It is possible to rent a boat for Private tours or join daily shared tours to Capri and the Amalfi Coast. The boat charter company is located in Marina del Cantone. We had a wonderful time at Pippo's house. The newly renovated space is spacious and stylish with beautiful views of the water. We were able to walk to the water, where there are restaurants and a few shops. It's an excellent place for people who want to be a little bit secluded - roughly a 45 minute drive to Sorrento and about one hour to Positano. We loved going through the walking paths to reach the town of Termini, at the top of the mountain, as well as the beach. Though we didn't cook a meal at home, the kitchen has everything you would need and the outdoor spaces include a spacious deck with a hot tub. We would definitely return. This property is in a small Italian village. The experience of shopping where the locals do, the views, the cleanliness, the modern comfort were perfect. The best part of our experience was the amazing service we received from the owners and their staff! Total first class and I would highly recommend if you are looking to get away from it all and just relax. The home is beautiful and so well designed as is on the pictures, if only pictures could translate the feel you would want to pack your bags and go ther immediately. Our beds were the most confortable from all our stays, this owners really put a lot of thought on this property, if you decide to stay here all you need is maybe a small car to drive around as is so easy to find your way around and your stay would be one of the best in this coast. If not the town bus stop is only a few steps from your front door. I have been in this area before and we stayed in Sorrento and Positano at great hotels but this time we decided on Nerano as it was in between the two and we wanted to avoid being in the middle of the tourist crowds all day long, it is the most peaceful at night, everyone knows each other, the owners are extremely accessible and accommodating, probably the most of all out 5 HomeAway rentals. Pippo, Rosa & Cleila are one the most Elite, Kind,Sencire & Genuine people you will ever meet, they make you feel like family immediately. Pippos wife owns an amazing restaurant right by the water, we had the most amazing food and service, there is enough restaurants of high quality in the area at times you don’t even want to leave the village. If you stay here you are going to want to be back sooner then you think.. love it, love it!!!! Thank you very much for the wonderful review! We are very happy you spent a lovely time, we enjoyed your company. You and your daughters are wonderful people. We really look forward to have you again as our guest maybe in the future.